This Wednesday Waggle is a quick one that is hopefully going to rev up your level of excitement about The Open Championship which begins tomorrow, 12:30am, central time, Thursday morning. It has become the World Championship of Golf (men’s golf). One of the Golf Channel announcers mentioned that basically every top golfer in the world puts The Open Championship on his calendar. There you go! The scenery and courses are so different than most of those here in the U.S. Genuine links courses have the same grass from tee to green, just cut to differing lengths. The rolling fairways and greens, deep pot bunkers, tough rough, gorse and other trees and shrubs we rarely see add to the intrigue and excitement. Beautiful! The weather! Oh, man! Summer in the British Isles means everything from sunny and 70-degrees to windy, rainy and 50-degrees. And play goes on as long as the course is playable and the wind isn’t blowing a stationary ball all over the place. Davis Love III was once asked, “What is the most layers of clothing you have ever worn during a tournament?” His reply, “That’s easy, 5 layers. It was the 198x, (I don’t recall the exact year) British Open!” Yes, fans love it, players really don’t care for it, but they have no choice but to accept it. The shotmaking! Links golf is different from the style of golf we play in the U.S. Here we mostly shoot, fly the ball in the air, to a target and try to get the ball to stop as close to it as possible, with not much rollout. I believe it was 5-time Open Championship winner Tom Watson who said, “Links golf begins when the ball hits the ground.” What does this mean? Weather and course design are friendly to a lower ball flight and the players with the best imagination, creativity and visualization and execution, of course, can understand how to find the spot to land the ball so that it rolls, sometimes a very long way, to get in a proper position for the next shot. You roll your ball to the desired position, rather than fly it. Target golf in Scotland needs soft greens and light winds. You will see shots this week that will truly amaze you at the talent level of these players. Absolutely fascinating! The fans. The British fans have a reference and respect for golf that is deep and profound. Yes, they would like one of their guys to win, but they appreciate proper shotmaking on their golf courses and they give props to those who make them. 2 of the most beloved, by the British fans, Open Champions, are Americans Arnold Palmer and Tom Watson. There is no adequate measure of the love and respect these great men receive from this audience. We can learn from this wonderful attitude of respect for the game and those who play it. OK, that’s enough for now. Hopefully this has you fired up for that start of play at 12:30am, central time, tonight, on The Golf Channel. Double-check the TiVo. In today’s Wednesday Waggle we will take a look at this week’s PGA tournament and offer some input as to why The Masters is very important for your son/daughter. There are more reasons than this space allows as to the importance of The Masters to your son and the rest of your family, in fact to all sports fans everywhere. Let’s hit some highlights. 1st, it’s the first men’s major championship of each year and the field will include many of the best players in the world. That alone should make it very important. 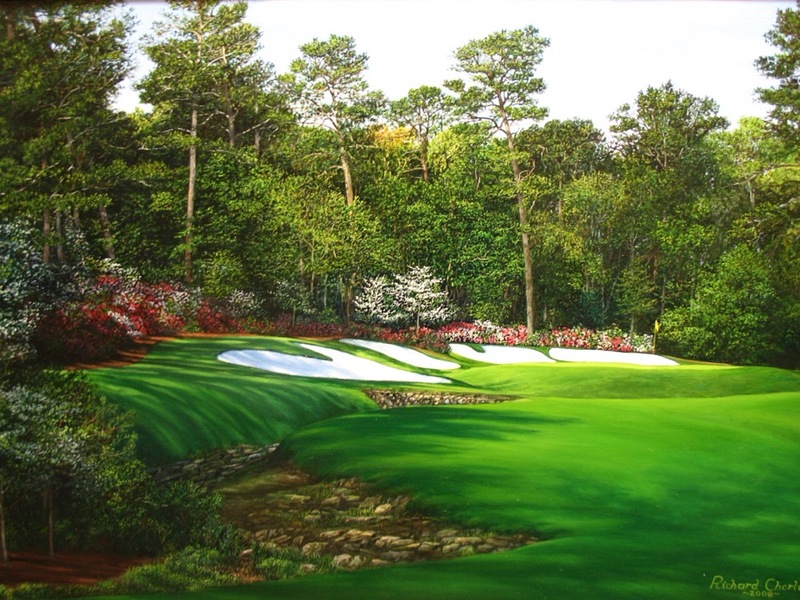 2nd, Augusta National Golf Club, the permanent Masters venue in Augusta, Georgia, is one of the most beautiful places anywhere. Amazingly gorgeous flowers are blooming all over the course and the fairways, greens, traps, hazards, paths, every square inch seems to be perfectly manicured. We look forward to every minute of TV coverage so we can enjoy this visual feast. 3rd, The Masters is loaded with great traditions. From the ceremonial opening tee shots, done for years by the legendary Big Three of Arnold Palmer, Jack Nicklaus and Gary Player. With Arnold’s passing last September, Jack and Gary will do this year’s shots. And then there’s the awarding of the renowned green jacket to the winner on Sunday afternoon and any number of traditions occurring in between. 4th, the golf is great! The players will tell you that this is one of the toughest courses they play. The greens are lightning fast. The undulating and rolling fairways, much more so than the TV cameras show, almost never leave a flat lie and stance for the next shot. Water and traps are just begging for golf balls to enter them. And even with all this there are players shooting under par. Wow! 5th, tickets to this event are widely known as possibly the toughest ticket in all of sports. Just having an opportunity to be a patron, as the fans at ANGC are referred to, is a rare situation. Go for it! So what does this mean to your youngster? Hopefully he’ll dream more and bigger dreams. I mean every pro playing in this event dreamed about it as a kid and probably as a pro too until getting his 1st invitation to play in The Masters! Heck, I’ve dreamed about being a patron and that’s tough enough!The sheer beauty, pageantry, traditions and excellent golf should end up being more than enough to get your kiddo revved up. So Parents, your action is to make sure you TiVo the tournament. Thursday and Friday are on ESPN and Saturday and Sunday are on CBS. We always record 2.5 hours beyond the scheduled Sunday end time to allow for possible playoffs. In this Wednesday Waggle we will take a moment to look at some history, Goldfarb Family history. This is San Antonio’s week to host our PGA Tour event, The Valero Texas Open, and the VTO has a very special significance in our family. Join us for some great memories. When I was a kid growing up, going to school and playing golf, I knew my Dad was involved in a lot of civic activities, but really I had no idea how deeply he was participating in some of theses areas. Golf is our family sport so there was always something golf happening in our world. It was so common and constant that I never looked at it as something special. Even when I was talking to Arnold Palmer after one of his rounds at Oak Hills in the 1960’s, I didn’t realize what a special moment that was. I mean, I was just a kid going along doing stuff that seemed pretty routine to me and in those days, Arnold was always hanging around visiting with folks and my Dad and Mom, and sometimes I were helping run the tournament. So at tournament time, we were always around the players. It was much more casual than it is now. It also seemed natural that Dad was always holding some big office in SAGA, San Antonio Golf Association, like President, Tournament Director or Hospitality Director for the 1968 PGA Championship held here at the excellent Pecan Valley Country Club. He always had some position of serious responsibility. I helped Dad set up the brackets for the State Junior Championship in the late 1960’s when Ben Crenshaw won it twice. I recall seeing Ben’s handwritten entries that were mailed in. As special as all this was, I didn’t understand it at the time. Makes for great memories though! Dad co-founded the State Junior (Championship), as it was then called, along with Brackenridge PGA professional Murray Brooks. Those 2 along with my Mom and a few friends ran this prestigious event for more than 25 years! So how did we get to the VTO? It’s a long and interesting road that, like so many things, started with a vision many years ago. It was in 1938 that my Dad, Sam M Goldfarb Sr, and about a half-dozen other San Antonio businessmen formed the San Antonio Golf Association to provide support for the San Antonio golf community and to bring back the then defunct Texas Open, which they succeeded in doing. So this week’s VTO with all the amazing on-course temporary construction, vendor’s booths, super-duper digital scoreboards and all the eye-popping visual treats of a major sporting event owes a debt of gratitude to those founders, those men of vision of 1938. Thanks Dad for everything! I love you!